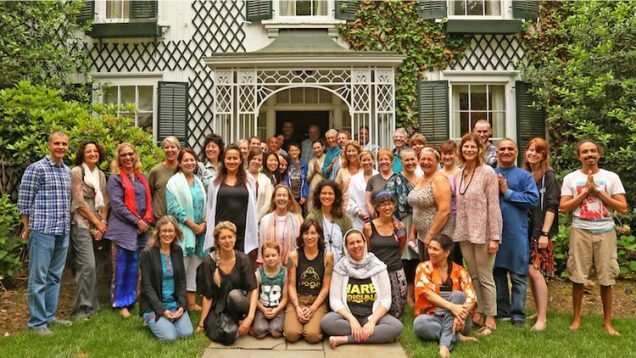 Lovers of spiritual inspiration may want to set a weekend aside this summer for the Heart of Yoga retreat, to be offered in New York for the sixth time from June 1stto 3rd. The event grew out of the Bhagavad-gita classes senior Prabhupada disciple Yogesvara Das taught at Jivamukti for ten years. This June, Heart of Yoga will be held at the Everveda Ayurvedic Center on Long Island, a three-acre oasis run by Jill Dalve. With a host of workshop rooms, a large backyard with an outdoor yoga platform, fire pits and a salt water pool, it’s a relaxing setting. Attendees will run the gamut from practicing yogis to initiated devotees, many of them affluent professionals. Among previous participants have been the head of production at a New York broadcast media company; the owner of a sports therapy health clinic; a dean at an East Coast university; and a number of yoga teachers, designers and artists. Nevertheless, many who have attended previous retreats have become initiated devotees. Others took to chanting on a regular basis, and perhaps most importantly made friends with other bhakti afficionados. Each morning of this year’s retreat will begin with an optional morning program of arati, japa and Bhagavatam class in front of a full altar. The days will then be full of one-and-a-half-hour workshops by special guests Radhanath Swami, Raghunath Cappo, Rukmini Walker, and Yogesvara Das (Joshua Greene). Radhanath Swami will host an open question-and-answer session; Ragunath, a respected yogi, will teach yoga classes; Rukmini, also a disciple of Srila Prabhupada, will speak about women in Vaishnava history and the feminine in bhakti; and Yogesvara will give a theme-based presentation, perhaps on the correlation between Vedic cosmology and physics. 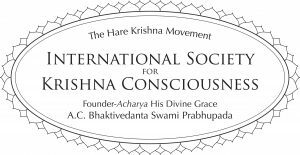 “Everything is just a starting point, really, for a discussion of Krishna consciousness,” Yogesvara says. In order to keep classes small and intimate, participants will be divided into small groups of 12 or less, and will rotate through the different sessions so that they get to attend all of them over the weekend. Afternoons will include a choice of more recreational activities. There will be an improv class with Yadunath Das, one of the founding directors of Chicago City Limits, New York’s oldest improv theatrical group. His wife Ekanta Bhakti Dasi will lead with him. There will also be a nature walk through the nearby Theodore Roosevelt bird sanctuary with master arborist Dan Dowd. “He’s wonderful at opening our eyes to the mysteries of nature we wouldn’t otherwise see,” says Yogesvara. Finally there is a healing bowls session with Denise Mihalikh, a type of therapeutic technique used in Tibetan and Japanese cultures using sound vibrations created by gently ringing metal bowls. 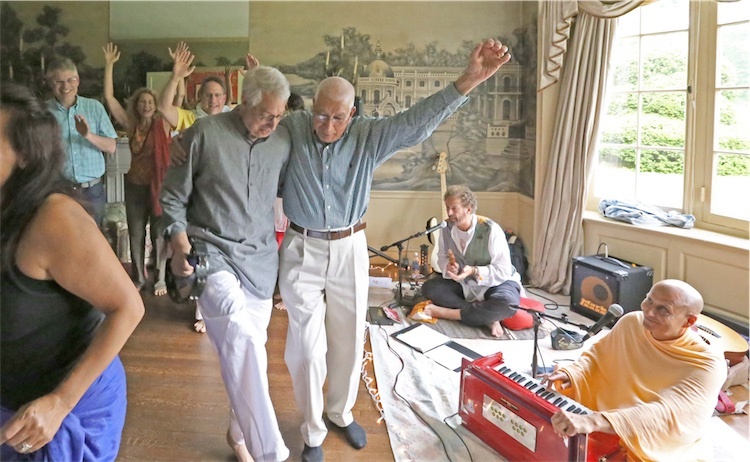 In the evenings there will be dinner, as well as lots of kirtan and then satsang led by the special guests. “We’re going to have fires in the fire pits; roast vegan marshmallows, and sit around and just chat about whatever’s on people’s minds,” says Yogesvara. 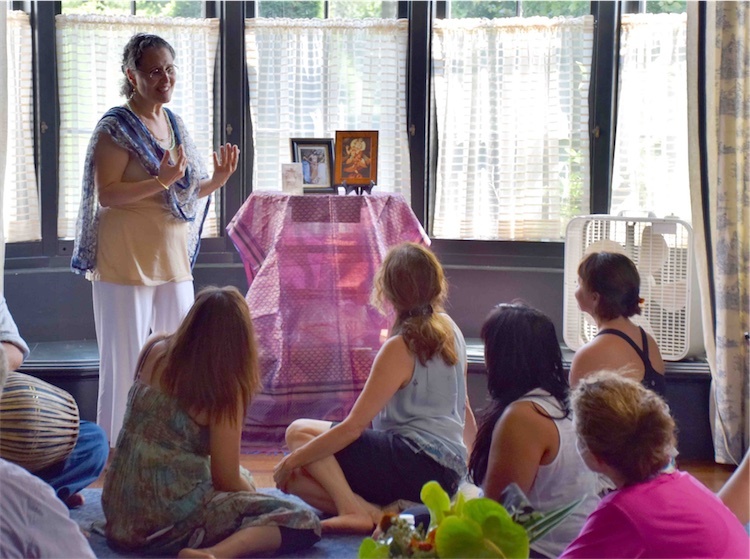 Alicia Gough, a student of Yogesvara’s who now helps coordinate the retreats, says she hopes Heart of Yoga will leave participants with a deeper understanding of bhakti – of devotion.